Last week I had dinner at my mother-in-laws house, and her friend Vicky, who happens to own a small farm in Selma, was there too. I asked her if she knew any Francos. She shook her head but replied, “There are only two Franco families in Selma, so it’s got to be one of them.” I asked her if she knew where the old Selma Winery was and if it was still around. She told me it was behind her house, the same place where the labor camp was once located. Days later, on my way to a Dr.’s visit (I intentionally found a Doctor in Selma so that whenever I’d have to make an appointment—and take time off work to do this—I could spend at least an hour poking around there. Of course one hour has a way of turning into two or three), I drove out there, and actually found the place. I remembered being on those back roads as a kid, in the bed of my grandfather’s pick up truck, staring out at the miles and miles of grapefields. It was familiar. The Winery sat abandoned and tattered in the countryside, surrounded by fields in all directions. Dust clouded around it and tumbleweeds collected against a warped fence that was put up to keep trespassers out. A tall pine tree stood in front, its roots reaching toward a nearby irrigation ditch. The aluminum siding was flaking off the old structure and graffiti ruled everything. High above, at the tip of the tallest point, in weathered black paint in read: SELMA WINERY. But it looked as if something else was painted over that, another word, I couldn’t tell. Pigeons roosted in the dark corners. Oxidized orange spilled over all sides of the walls and support beams. A slab of concrete with spider-breaks and gouged chunks rolled out toward the dirt path. I stood next to my parked car, along the irrigation ditch, and gazed quietly over the details of what once was, paying careful attention to the ghosts. Only a hot breeze rustled the loose edge of a fallen sheet of siding, and a few sycamore leaves skipped past. I got back in my car and drove around the perimeter. The fence blocked off the main road, but nearby was a dirt bridge with a private road sign riddled with shotgun pellet holes. The road lead to a line of wilted houses and crooked trailer homes, old car parts and piles of junk adorned the yards. I drove over the bridge and followed the dirt road, slowly passing the houses and barking dogs. A woman peeked out from behind a curtain and eyed me curiously. I parked close to the Winery, down in the bed of where the Kings River once ran. It was the same cradle used as the natural boundary line, where once field hands and Winery workers could pitch their tents and live out the season. I imagined it must’ve been the spot where Bea and Jack lived together during that short Fall in October of 1947. Now the land was stricken yellow with nothing but an old discarded couch and a nest of field mice. I hadn’t noticed but a few men had gathered across the dirt road and were staring at me. They leaned against the back of a pick up truck and smoked cigarettes and stood silently. I nodded at them. A small dog sidled up to one of their legs and got nudged away with the tip of a boot. The dog cowered and began making its way toward me. I walked back to my car and got in, then turned the ignition on and ambled up the dirt road. The men turned their heads, eyes followed me, until I was back on the road and out of sight. 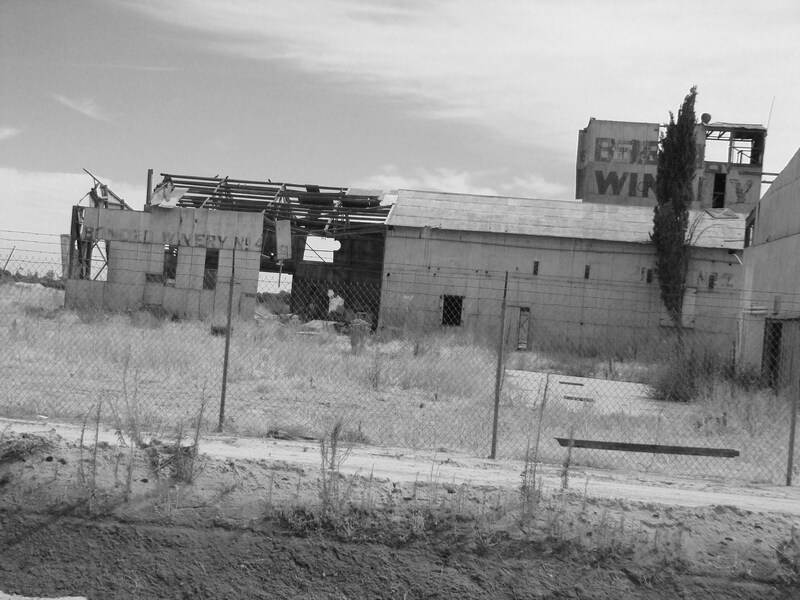 Below is one of several photos I took of the old Selma Winery in 2009. I believe it has since been demolished.